I’ve been promising people that I’ll write an updated review of the CRM and I figured HubSpot’s announcement of the HubSpot Sales platform was the perfect occasion to update my review. For those who just want to know bottom-line what I think today, the answer is that I don’t still like the CRM...I love it. It is still the single best CRM I’ve ever used as a salesperson or executive and it continually gets better. That doesn’t mean it’s right for everyone, so for those that want a deeper review, here you go. HubSpot Marketing: This is their flagship product that the vast majority of people know HubSpot for. 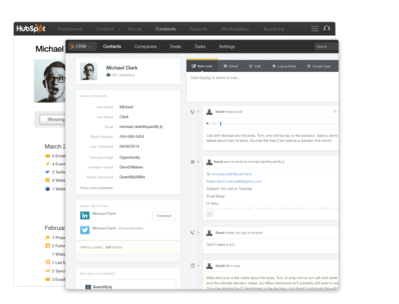 HubSpot CRM: This is the free CRM they announced at Inbound 2014. HubSpot Sales: This is their sales enablement tool set. It was originally released as Sidekick, and a premium version of the tool was called Sidekick for Business. Today (literally today) it’s now simply HubSpot Sales. There’s a free version and a premium version. All three products seamlessly integrate with each other. The focus of the majority of this review involves the use of the CRM and the sales tools. Full disclosure - my direct experience with the CRM and Sales platforms are with the premium versions and not the free versions. HubSpot’s free version of the CRM is a very nice free tool. If you’re looking for a CRM that will let you keep track of activities, manage a pipeline and keep things in order, the free CRM will work very well for you and you’ll be happy. However, if you’re looking to really drive efficiency and accelerate sales activities, the free CRM won’t get the job done. Of course, no free CRM will do that. The biggest advantage of the free version for me, and I would extend for most high-growth sales organizations, is that the users in your company that are not actively involved in the sales process will have access to the CRM without having to pay a user fee. For many companies (ours included) where only 20-30% of the people who need access to data in a CRM also need access to the full selling capabilities of the CRM, this represents a very strong value. The first thing you’ll notice when you use the CRM is that it’s just so damn simple to use. While there are certainly some intricacies that aren’t so obvious, like how to set up the contact fields that show on your screen; the core sales-focused functionality requires very little training and use to become second nature. The CRM’s integration with your email is also a joy. This benefit is multiplied if you use Gmail as your email server. With Gmail, in the click of a button and an authorization, your email reader and the CRM become one. You’re not only syncing emails that you send with the CRM, you’re actually using the same server. This means that both the emails you send and the emails you receive are right in your contact’s timeline. Adding contacts in the CRM (which is frankly the disdain of many salespeople) is virtually effortless. As an example, yesterday I was talking to a prospect and a new contact was introduced into the conversation. Of course I needed to add her to the CRM. To do that, I simply copied her in my email following our meeting, and the CRM realized that she did not have a current record in the system and it created an additional record filling in the key information for me. Additionally, it identified that the email I used matched a company profile that was in the system so it automatically linked her to that account. I literally did no additional work and my actions were recorded and logged. These attributes are certainly nice (and take disruption away from my day), but they’re only a small piece of what makes the CRM such a powerful sales accelerator. The real power of the system comes when you add the Sales platform functionality. The magic of HubSpot originally was not that they created apps that did something that no product ever did before, but that they put all the apps together in one simple, easy to use and totally aligned platform. This enabled marketers to do more things effectively than they could have done when trying to piece together a bundle of different products. What HubSpot Marketing did for marketers, HubSpot Sales is striving to do for salespeople and executives. While there is still a distance to go, they’ve made some amazing progress. As I shared in a previous post, sales enablement tools are quickly moving from nice-to-have toys to need-to-have components of the selling process. While there is a product that does every function of what HubSpot Sales does, there is no product that does all of them. Call Que and Dialer: If one were to do a time and motion study of a salesperson at work, they’d most likely be shocked by how much time and energy is lost from the time that the salesperson finishes one call, hangs up, moves to their next call and dials the phone. With HubSpot’s dialer, that entire issue goes away. We’ve literally seen 100% increases in sales rep productivity when they use the dialing capability vs. when they don’t. I use the feature so often, that today I actually get frustrated when I’m calling a friend in the evening and I actually have to touch my phone. It addition to automating the call, it records the activity so the rep doesn’t have to do anything to track activity. Taking notes during the call is easy because a note screen immediately appears when the call connects. Reps also have the option of recording calls. We use this feature to save time taking notes and for use as a coaching tool. As I said 15 months ago, if this were the only feature of the premium version, it would be a bargain. The Power of Data and Email: In my opinion, the biggest challenge facing mid-market sales organizations is that the actions they take are still driven more by gut and instinct than anything else. The problem is that gut instinct is often wrong and totally not replicable. Today, there is no reason to make gut decisions when you can use facts and data instead. With email tracking and templates, we can now measure the effectiveness of our reps actions on a rep-by-rep and email-by-email basis. Marketers have had this ability for years and it has led to far more effective email strategies. Now we have the ability to bring this to the sales side. The ability to create numerous email templates not only saves reps time, it makes them more effective. Don’t get me wrong, I love salespeople, but many of them simply can’t write well. They destroy their capability because they send a follow-up email that barely meets the standards of 3rd grade writing. By giving them a template, they have the structure of a good email built in and have the ability to customize as deeply as needed. Scheduling Meetings: I used to be like all of my sales rep friends. I was crazy about controlling my calendar. So when all of these apps came out that created links that allowed people to schedule meetings with you, I avoided them. I simply refused to give up control of my calendar. Of course, one of the most frustrating parts of my daily routine was the back and forth with various people trying to nail down meeting times. I’d send times that I was available and by the time they responded, the time they requested was booked (or vice versa). When the meetings app came out, I figured I’d give it a try (but only in limited situations). Well, that lasted about a day. Today I use the app for everything and I use it every day. Scheduling meetings has gone from being a big frustration point to something I don’t even think about anymore. There’s nothing particularly unique about HubSpot’s meetings app. There are many other apps that provide the same functionality, though I do like HubSpot’s interface and UX better than the others. The real value here is that the tool is integrated with everything else. I even have the ability to use it on my website where and when I want. There are a couple improvements that I’d like to see, like scheduling for multiple people, uploading files and creating different meeting types that follow different protocols. Prospect Intelligence: On the initial release, this was one of the most powerful features. Today it’s still very good. I use it regularly when researching leads and when having conversations with them. We also use it in our lead classification process. That said, there has been little enhancement to this area, and what was once great is now only good. To maintain relevance here, HubSpot either needs to add the type of data and insight you can gather or create integrations with lead intelligence tools. I find that I’m increasingly accessing other lead intelligence in addition to what the HubSpot widget provides and this reduces the value of it. Reporting and Tracking: Fifteen months ago, this was a huge weakness. That’s no longer true. HubSpot added the ability to export virtually any view you have to an Excel or csv file. This makes tracking and assessing things far easier and more valuable. However, as I’ll share below, there are still some big issues for HubSpot to address. The Deal Dashboard and Pipeline Tracking: This is still one of my favorite features. The recent enhancement that now allows multiple pipelines to be tracked is a huge plus. Integration with HubSpot Marketing: Alignment is big in my world. The fact that both platforms work off the same database is a big benefit. The ability for salespeople to initiate marketing protocols and marketing to initiate sales is also a big benefit. The ease is a boon to the sales operation function as it save numerous man hours trying to manually keep things aligned. There are certainly a number of good CRMs out there, and I have to admit that I’m certainly biased now towards the HubSpot CRM. There are, however, some situations where HubSpot is not a fit. If you have very complex rules or processes that guide your sales functions, then you’ll most likely find that HubSpot CRM does not give you enough control. In those cases, Salesforce.com is still most likely your best option. Administrative Controls: While I don’t think there’s any need for HubSpot to provide the same level of control that Salesforce.com does, it needs to provide more than it currently does. The introduction of limited user levels was certainly an improvement, but is not enough. For example, today you can set one default view (and it becomes default fields in every view and can’t be taken out of a view), but different salespeople need to know different things at different times. The CRM still does not allow you to create multiple standard views or to provide more than one view option (for example, as a sales rep I may want to see one set of information early in the sales process, and something different as we move deeper into the journey). It only schedules a sequence of emails. Rarely is a salesperson implementing an email track exclusively. They’re also making calls and potentially other things. For Sequences to be a killer app, it must enable reps to program their entire selling sequence, not just one piece of it. While the specific emails are customizable, the sequence itself is not. For example, if you have an email going out on day 9, but you know your contact is on vacation, you can’t change the date for that contact. You must unenroll the entire sequence. To enroll in a sequence, you must enroll on a contact-by-contact basis. When you’re enrolling multiple contacts into the same sequence, this can be quite tedious. Reporting: Aahhh, reporting. Much pomp and circumstance surrounded HubSpot’s announcement at Inbound 2015 about the Reporting Add-On. As a lover of data and analytics, I was excited that a weakness was going to turn into a strength. Finally...my prayers would be answered. I’ll be able to slice and dice data however I want. I’ll be able to automate analytics that previously took hours to prepare. Unfortunately, I’ve been disappointed with what’s been released. While it’s certainly a nice step forward and has some nice features, it is simply not worth the $200/month fee that is being charged. While the vast majority of HubSpot’s tools are intuitive, Reporting is not. It takes multiple variations to program the reporting function to give you what you want - if you’re able to get it at all. Currently every report on a dashboard must follow the same time frame. You can’t, for example see how many sales have been closed in the last 90 days, while also seeing the total number of MQLs that exist (you can only see for the last 90 days). Additionally, much of the data is driven by things that happen only in that period. For example, if someone downloaded a whitepaper 9 months ago and became a lead then, but this month they crossed the MQL threshold, reporting won’t properly reflect that because both actions didn’t occur in the same time frame. While you have more ability to create and customize reports than existed before, you don’t have the ability to slice it however you want. The structure is still limited. I promise to keep you posted when the reporting add-on fulfills its promise. Bottom line: I love the CRM more today than I did 15 months ago (and I loved it then). Of course, the more you love something, the more the weaknesses can frustrate you. I’m confident that these issues will be addressed, and I’d recommend that if you’re looking to get more from your sales efforts, check out the platform and see how it can accelerate your results.